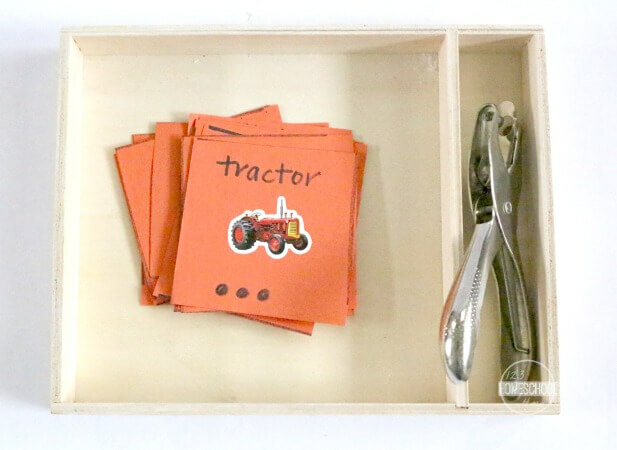 Help your child learn to recognize syllables with this hands-on syllable counting activity. Learning how to count syllables will help your child improve his/her reading and spelling skills. This Syllable Counting Punch Cards is great for your beginning or fluent reader in Kindergarten, first grade, or 2nd grade. When introducing syllables, I teach my children to listen for sound “chunks” within a word. Sometimes hearing and breaking the word up into syllables is easy, but for those other words, I find that clapping along each syllable is very helpful. To reinforce the teaching of syllables, I made these Syllable Counting Punch Cards. 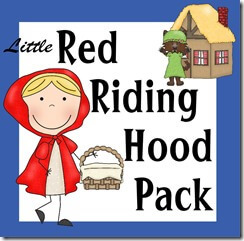 You can make your own with sticker as described below or print the FREE Syllable Counting Punch Cards below. To make your own syllable counting cards, divide a piece of card stock into sections with a marker; I was able to do 3 across and 4 down. With your stash of stickers, choose a sticker for each counting card. I chose stickers of objects that were 1, 2, or 3 syllables. On each card I wrote the word on top, and below I drew in three circles. 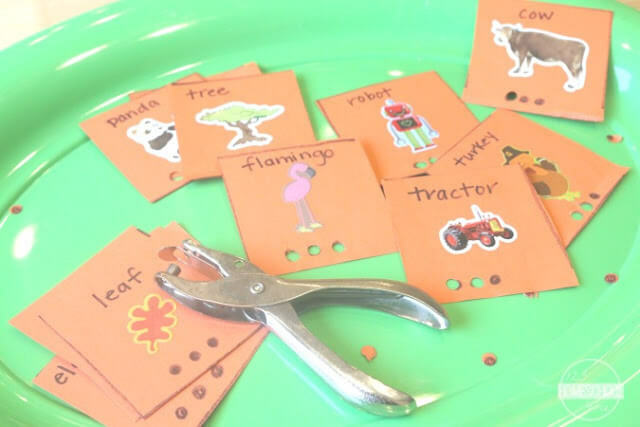 Present the syllable counting cards with a hole punch. My daughter’s task was to say the word aloud, count how many syllables were in that word, then punch that number of circles. 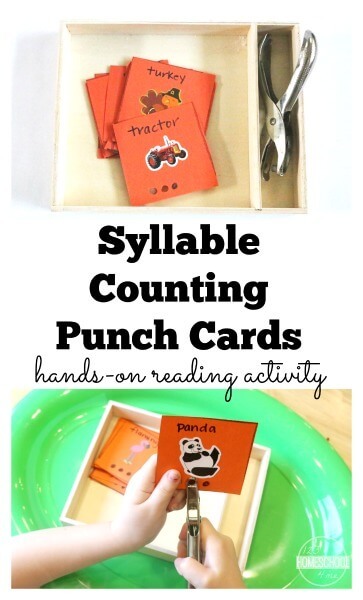 Your child can punch the syllable counting cards as they speak the word or say the word and then punch holes in the counting card. For instance, my daughter and I said the word ‘Panda.’ As I said the word I tried to make the syllables easier for her to hear, so I put extra emphasis on the syllables ‘pan/da’. Since there are two syllables, my daughter then punched two circles with the hole punch. The idea is to have fun while learning and/or reinforcing a new skill! 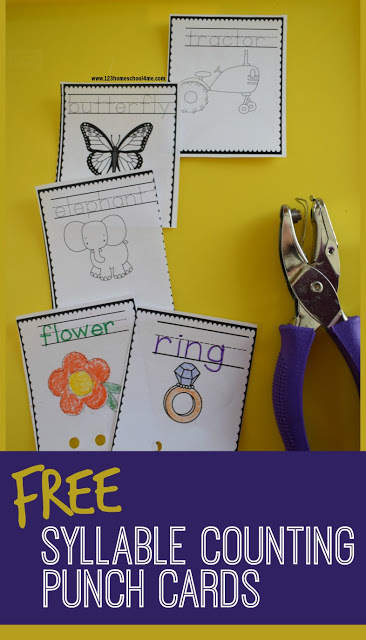 These syllable counting cards not only reinforce an important reading and spelling skill, but with the hole punch I sneaked in fine motor skills practice, too! 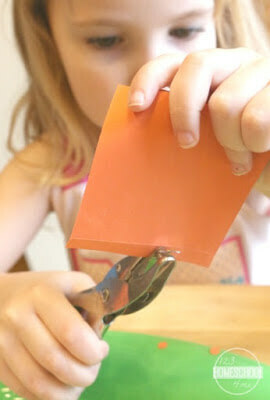 If you follow my blog, you know we love working on fine motor skills! Continue to have your child work through all the syllable cards until they are done with the task. 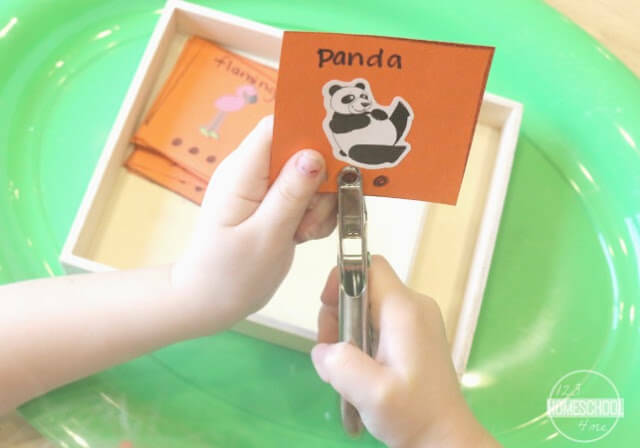 For self-correction, you could also write the number of syllables on the back of the card so the child can find out if he/she was correct.